Gee chose to wait until a suitable territory became available in May 2010 before joining Driver Hire. He had become aware of Driver Hire through Enfield franchisee Manjit Singh, a personal friend. 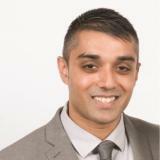 Gee has a background working in IT for a leading City law firm for over 10 years. However he clearly has an entrepreneurial spirit just below the surface – his father had his own business – and once he had decided to become self-employed there was no turning back. Just over 2 years down the line, and in economic circumstances that are still challenging, Gee is a true rising star in the Driver Hire network, scooping the 2011 ‘Newcomer of the Year’ award. In Gee’s first full financial year he achieved sales of over £850,000. That’s significantly more than twice the £349,000 current UK average turnover as revealed by the latest bfa/NatWest industry survey. “Before joining Driver Hire I had no directly relevant experience, and this is a tightly governed industry,” says Gee, who is still in his early 30s. “However, once you have a good understanding of the products and services provided by Driver Hire, and you use their business model and systems to help you, it’s all actually quite straightforward. All in all, it is no surprise that Gee’s personal success has led him to be shortlisted for the prestigious bfa ‘Franchisee of the Year’ Award 2012.